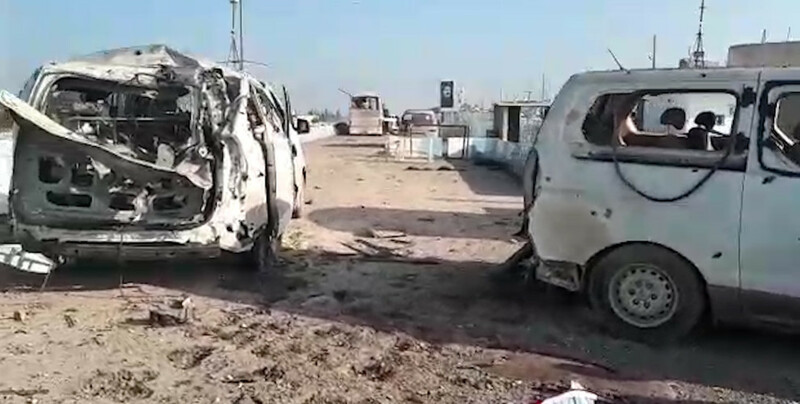 ANF has acquired footage from the civilian convoy which was bombed by the invading Turkish state, exposing the misinformation that “military vehicles were hit”. The footage shows civilian vehicles torn to pieces with bombs and shrapnel. Originally published by ANF News. A convoy of civilians who were traveling from Cizire to Afrin to show support for the resistance that has continued for 35 days were hit by the invading Turkish state. One civilian was martyred and 12 others were wounded according to the first information from the site. The martyred civilian was 28 year old Salim Xilêf. Civilians Baqî Xelîl (24), Reşîd Hisên Mihemed (22), Wensa Umer Şawîş (58), Xêrî Coqî Şengal (23), Rende Hisên Celal (20), Ekrem Bedran Biro (21), Rocvan (21), Xalid Tewfîq Elî (45) and Mihemed Xalid Yeqûb (60) were taken to the Avrin Hospital for treatment. Civilians Mihemed Şêx Nebî, Xalid Xelîl and Merwan were also wounded. The invading Turkish state served articles and videos through the Turkish Special War Department to deceive the public. ANF acquired footage from the civilian convoy bombed by the Turkish state, exposing the misinformation that “military vehicles were hit”. The footage shows civilian vehicles torn to pieces with bombs and shrapnel. Several civilian vehicles can be seen being destroyed in the footage, while there is no sight of even one military vehicle or piece of equipment. This has shown that the Turkish state has committed another war crime last night. ANF news, February 23, 2018. Next post: #Helsinki March 3: Everywhere #Afrin, Everywhere Resistance!